8th April, 2016: FISHING REPORT: Port Alberni Inlet, Barkley Sound, Ucluelet (West Coast), Somas-Stamp River System. It is now April and most avid fisher people say that the 2016 saltwater fishing season is officially here. With weather patterns now becoming more predictable anglers can get out on the water with a little more ease in those many areas that are not located in “protected” waters. The migratory flow of early Chinook salmon headed down the coast line to natal streams to the south begins in April. 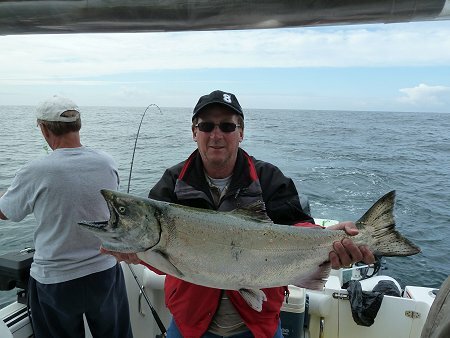 Feeder or winter Chinook salmon are also in local waters in April and into early May. The Migratory salmon and the feeder Chinook gorge on the ample amounts of bait fish. 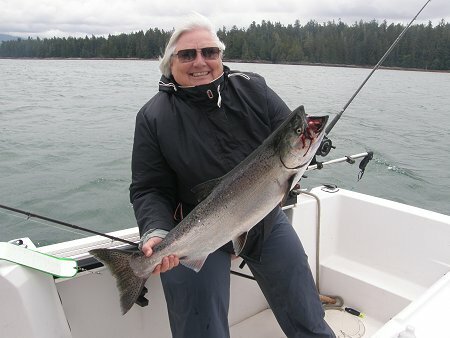 April can certainly have some very good fishing days in Barkley Sound and around the Ucluelet Harbor. Not only is the ocean fishing good but the Stamp River is often very good with large numbers of wild and hatchery Steelhead in the Lower and Upper River. Many say that April can often be the best month of the year to fish winter Steelhead. This is also a month with very little fishing pressure making it a time where keen river anglers can fish the Stamp in solitude. The weather at times has made it difficult for sport fishermen to get out on the water. The last week of March and into early April however has been quite the opposite. 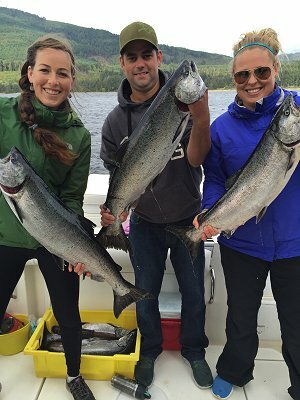 Water and Weather conditions were more than perfect and salmon fishing has been quite good in many locations. The Sproat Lake Derby which occurred in early March had a twenty-four pound salmon take top spot. Barkley Sound has been “alive” with bait fish over the past month. The herring spawn in Barkley Sound has been spectacular and with the start of the early summer run of Chinook headed to southern watersheds we are expecting some wonderful fishing out on surf line locations. Areas like Kirby Point, Cree, Effingham, and Edward King have recently had a few good reports of hatchery Chinook being landed. Areas on the inside such as Vernon Bay and Swale Rock have also had some good fishing for winter feeders. As time moves forward into late April and early May the fishing should really improve. We are definitely looking for some great fishing during the summer months. Forecasts are showing that the mid summer Chinook migratory flow to the Willamette and Columbia River will be very strong with most of the Chinook predominately being four year olds. With the weather patterns becoming more reliable those getting out to Barkley Sound should plan on fishing on the troll using hootchies, coyote spoons, or anchovy. One guide boat this past week did well at Effingham and Kirby landing over a two day period eight Chinook in the ten to fifteen pound category. The Chinook were hitting four inch cop car and the green-nickel and blue-nickel coyote spoon. Army Truck and green and blue needlefish hootchies were also working very behind a green glow hot spot flasher. The salmon are deeper. Fishing in one hundred and twenty to one hundred and fifty feet is not uncommon depths to fish. If you get close to the bottom around Swale Rock, Folger Island or opposite the Bamfield Wall don’t be surprised if a halibut hits your bait or lure. This is the time of year that we can often fish for a variety of wonderful tasting seafood delights. Often we can fish for what is termed a “seafood safari” and individuals can enjoy a day of crabbing, prawning, and rock and lingcod fishing (opened April 1st) and of course salmon. 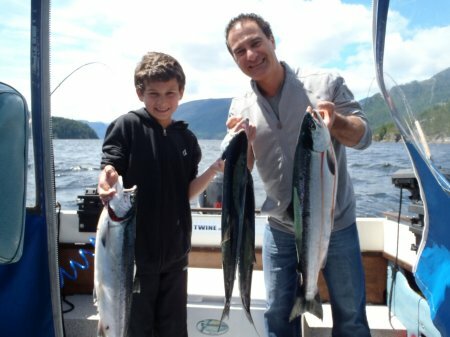 The salmon fishing close to the Ucluelet Harbor has definitely picked up over the past week. Beg Island, Great Bear, Forbes, Sail Rock, and The Alley has been producing some nice salmon into the mid teens. The herring spawn around Ucluelet has happened and there are big balls of needlefish and pilchards in the area which brings the salmon in close to the beach during tides to feed. Trolling is the best method to fish and it is important to watch the sounder and stay within about thirty feet of the bottom. Usual fishing depths for the areas mentioned are 90 to 120 feet. Coyote spoons have been working. The three and a half and four inch Irish Cream, glow green, and green nickel have been the best. Anchovy in a Rhys Davis teaser head in glow green, chartreuse, or army truck behind purple, red or green glow flashers have been used with success by a few guides although spoons seem to be the best choice at the current time.